through summer; feeds on small fish and squid. at 40 fathoms. 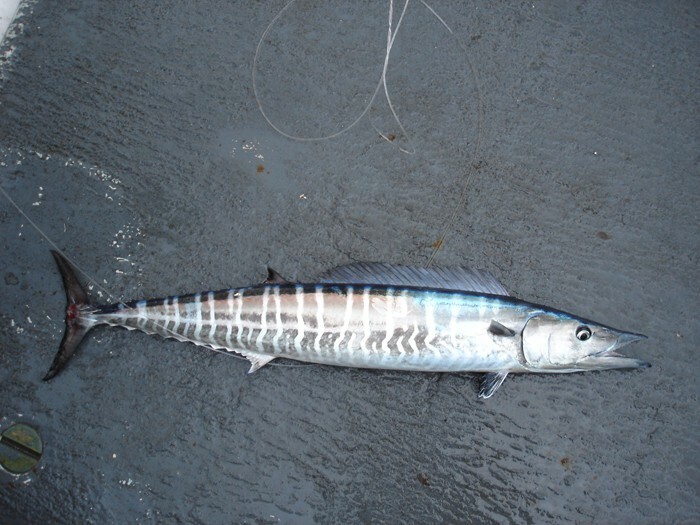 Although it is essentially unknown what the reason for Wahoo’s preference to this depth is, scientists have acknowledged they often hang around near the bottom in this part of the water column and then attack surface lures with a vengeance, often trying to slice their prey in half with their extremely sharp teeth. Our theory is the pressure gradient at 40 fathoms allows them to be comfortable yet still have the ability to feed on both the bottom and the surface. Mexican waters have many ledges very close to shore, and the depth often drops from 40 fathoms to a few hundred fathoms in only a few miles. oz, and was caught off of Loreto in 1996. The IGFA world record for rooster fish is when 114 pounds, caught off of La Paz in 1960.
aerial acrobatics. The Pacific variety are significantly larger than their Atlantic cousins – with an avergae fish being in the 80-100lb range – and much larger fish in the 120lb class common. 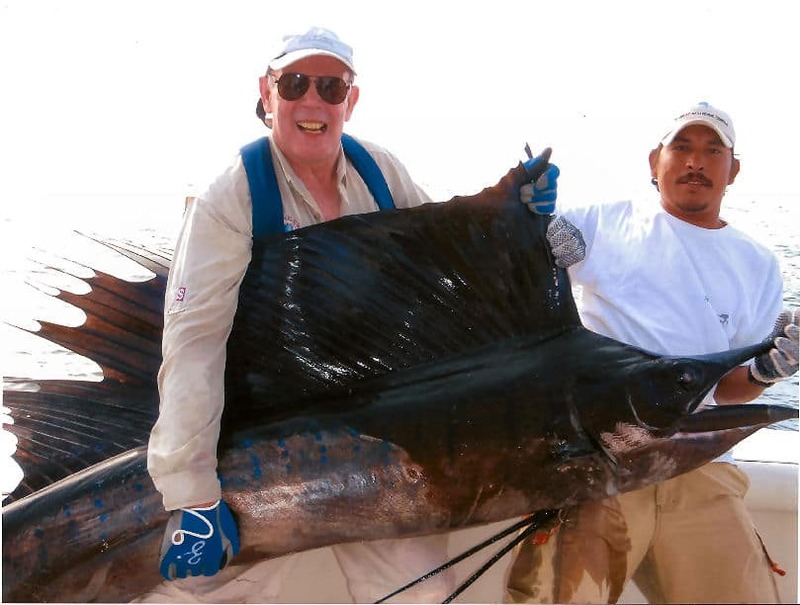 All fishing for sailfish and other bollfish in Guatemala is catch and release. 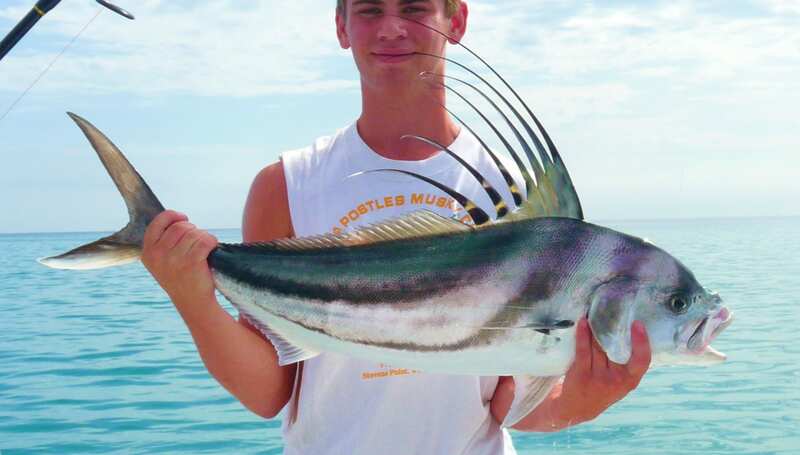 Caught by trolling, teasing, and drop-back baiting methods for those paying close attention to when they arrive in the lure pattern behind a boat, schooling Sailfish are the target of tournament anglers from Baja to Peru on the Pacific side and Florida to Brazil on the Atlantic side, with places such as Panama and Guatemala considered prime. casting gear while two or three crew will watch the bottle and the floating debris. Then the fun really begins. Long established as the premier destination for Sailfish, Guatemala is fast building a reputation also for Blue Marlin as well as Black Marlin and (rarely or less frequently) striped marlin. The productive and bait-rich waters and currents off the Pacific Coast of Guatemala, coming down from Mexico and pushing towards Panama already hold records for numbers of billfish – including most in a day on conventional (124) and on the fly (57)….as well as most in a season. The same factors that attract such numbers of Sailfish also contribute to the catch rates of Blue Marlin interspersed with Black Marlin at times. The fishery is primarily known for the prolific numbers of sailfish and remains largely undeveloped for Marlin, as the fleet has always focused attention and tactics that target Sailfish – but even with the smaller baits and slower trolling speeds we have seen a consistent trend of improving raises for Blues that average 350-400lbs. The season overlaps with the sailfish season, with most marlin raises occurring during the months of December and April – but because the fleet have not regularly targeted the Marlin, it is largely unknown as to the full potential – but we do have experience over past seasons of most boats raising at least one fish per day when the runs have been on. Our sense is that if we direct our efforts towards Marlin tactics, these statistics can only improve, and we anticipate the fishery becoming a significant Bluewater destination for all pelagics over the coming seasons. It is therefore a pioneering investment that is required – but the opportunity exists to be among the first to “discover” a new Marlin fishery, with the worst case outcome being to switch tactics and catch Sailfish either on conventional or fly until your arms fall off ! We have the boats, crews, equipment and gear – we just need some anglers with a pioneering spirit and a sense of adventure to accompany us. We will work with you to adjust our tactics to yours to make it a thrilling adventure for all of us ! Pacific Blue Marlin make their homes all across the Pacific, including the warm blue waters of Guatemala. The best season is considered to be in the months of November and April, but just like any species and fishery, yearly fluctuations do occur. Many major tournaments targeting Blue Marlin take place in October and November when most anglers feel the highest populations exist. 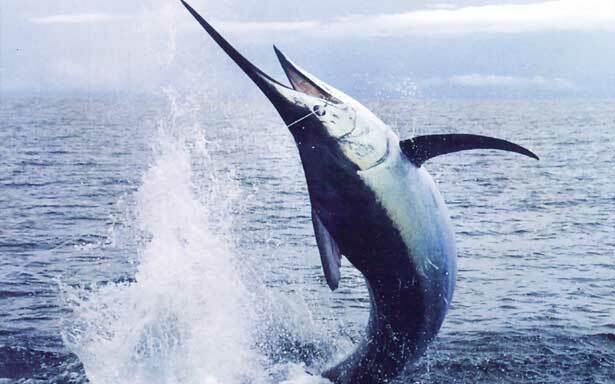 The Pacific Blue Marlin is considered by many to be sportfishing’s ultimate prize. Growing as large as 2000 pounds (the largest caught on rod and reel was 1,805 pounds in Hawaii in 1970), and often seen in Mexican waters from 300-600 pounds in season, the fish is as acrobatic as it is powerful. Alive, the Pacific Blue tends to make colossal runs – like times trial on a liquid dragstrip – and perform aerial shows that give even non-anglers the opportunity to witness their majestic beauty. The Blue Marlin is truly a treat to catch. Anglers like to troll artificial plugs, but when conditions dictate, live and dead baiting techniques are used extensively. Drop-backs are often employed, using Ballyhoo or similar fish as baits. When using live bait such as a skipjack tuna (7-15 pounds is a good size), the bait will exhibit certain behaviors while attached to the line. It will become nervous when a larger fish is near and a strike is impending, and this is where the angler’s and the boat driver’s skills must work in unison. Although many claim the right approach is to count to 10 or more after the initial strike, Marlin open their mouths wide and engulf the entire bait with a vacuum-like force, and the hook is often safely set about 3 to 5 seconds after the taking of the bait. Any longer and the fish tends to have swallowed the bait making for a less enjoyable fight and a higher chance of mortality caused by gut-hooking. Though many biological characteristics distinguish the Blue Marlin from the Black, the easiest way to tell is from the pectoral fins. On a Blue Marlin, the pecs are hinged and will retract close into the body, whereas a Black Marlin’s pectorals are fixed. The current IGFA record for Pacific Blue Marlin is 1,376 pounds, and this fish was caught in Hawaii in 1982. This staple table food fish is also one of the most exciting to angle for because of its abundance and aerial acrobatics. While out looking for Marlin, many anglers will often find a cargo net, a piece of plywood or some other floating debris with a nice school of Dorado underneath it. They are also often found in open schools during spawning seasons, and peak times are April or May through October. Spanish for “golden,” the Dorado is also known as the Dolphinfish or Mahimahi. There is another fish bearing the Dorado name, but that fish resembles a salmon and lives in South America, so don’t be confused. 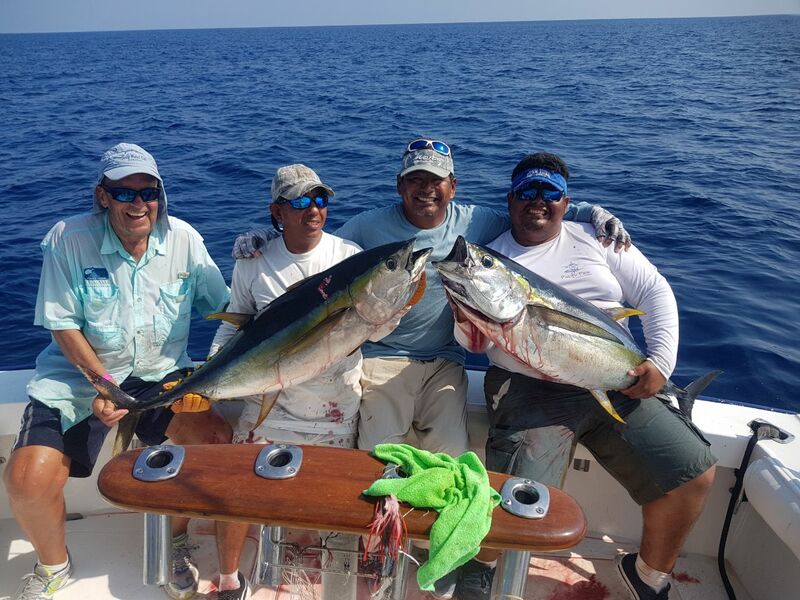 In Guatemala, the fish come closer to shore as the summer progresses, and while it might take a trip to 30 or 40 miles in the early season to find them, Dorado will often come in just a couple miles offshore as the temperature warms up. A popular technique for multiple hookups is to angle the first catch to a position off the stern of the boat, where it can either be left on the rod or connected to a floating bottle. The fish will return to the school, and as he does, one crew will get out the light tackle casting gear while two or three crew will watch the bottle and the floating debris. Then the fun really begins. are caught to some degree year round in Guatemala waters. A long time staple in the Central American diet, Yellowfin are succulent and flavorful, especially when prepared raw with Wasabi (a mixture of soy/shoyu and green-paste Japanese horseradish), and served chilled over a bed of shredded green cabbage. Hunt for the Yellowfin the same way you would for Marlin and other gamefish; look for piles of birds such as shearwaters that are active and organized. Mix up the lures to see what they bite on a given day; sometimes it’s big and purple, sometimes it’s small and green. Chrome jet heads are also effective. The fun thing about Yellowfin besides their pure fighting power is once you learn what they’re biting on a given day, multiple hookups are common. 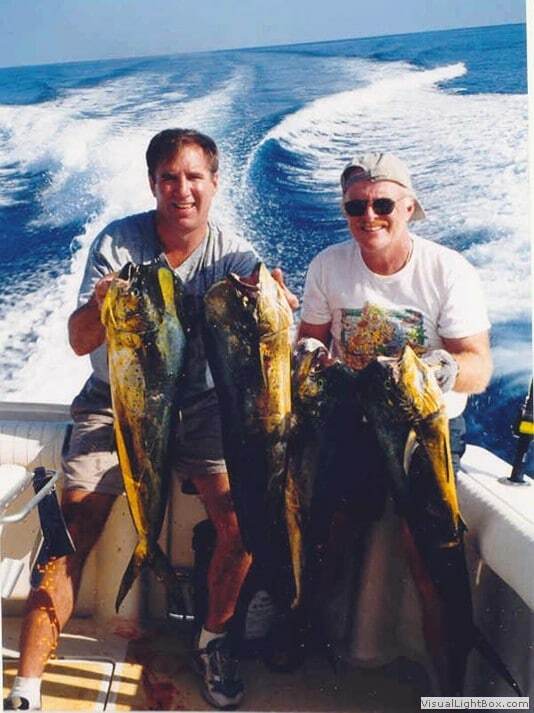 Bait should also be carried when targeting Yellowfin, because these fish rise and drop frequently throughout a day, and there are many times when they are down that the only thing they will bite is bait.